Our laboratory is developing advanced biophysical methods in vibrational spectroscopy combined with techniques in genetic engineering and isotope labeling to understand the molecular mechanisms of membrane protein function including energy transduction, ion transport and receptor signaling. We are focused primarily on rhodopsins, a large family of integral membrane proteins found in invertebrates and higher animals (visual rhodopsins) as well as various microorganisms (microbial rhodopsins). Rhodopsins are very diverse but still share many common features. The protein is about 250 amino acids long and forms seven a-helices spanning the cell membrane. 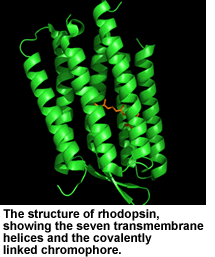 Rhodopsins are photoactive, meaning they undergo a series of conformational changes upon absorbing a photon. The core of the protein contains a hydrophobic pocket, which contain the covalently linked retinal chromophore. When exposed to light of specific wavelengths, retinal isomerizes, triggering a series of conformational changes in the surrounding protein. Visual rhodopsins in vertebrates undergo irreversible structural changes leading to a loss of the chromophore (bleaching) when triggered by light, whereas microbial rhodopsins undergo a series of cyclic changes comprising a photocycle, eventually returning back to their initial state. The photocycle can take anywhere from milliseconds to several seconds, depending on the type of rhodopsin. The physiological functions of rhodopsins vary widely. Visual rhodopsins found in the rod and cone cells of your eyes function as the primary light receptors in vision due to their role in activating G-proteins, which through a biochemical cascade control cyclic-nucleotide regulated ion channels. 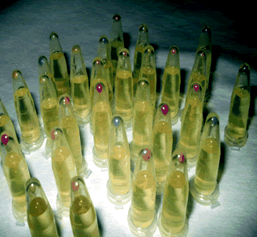 Light signaling rhodopsins called sensory rhodopsins are also present in microbes. For example, sensory rhodopsins I and II initiate either negative or positive phototaxis, signaling the cell to move away from or towards a light source depending on its wavelength. In this case sensory rhodopsins activate transducer proteins similar to those involved in chemical sensing in bacteria. Other microbial rhodopsins such as bacteriorhodopsin play an important role in energy conversion. Upon photon absorption, these proteins pump protons across the cell membrane to establish an electrochemical gradient. As the protons later passively diffuse back across the membrane, the energy is converted by other synthase proteins to chemical energy and stored in the form of ATP. In recent years, the rhodopsin family has grown significantly larger with the discovery of thousands of proteorhodopsins present in marine eubacteria in the oceans around the world. In addition to plants, which convert solar energy to chemical energy via photosynthesis, it now believed that a significant part of the Earth's energy-converting biomass is found in the oceans, with proteorhodopsin as a key player. Rhodopsins have been extensively studied in the past three decades by many biophysical techniques, and many details of their function have emerged. However, important questions still remain about the overall mechanism of energy transduction, ion transport and receptor signaling. The vibrational techniques we are developing in our laboratory offer a unique window on the structural changes that occur in rhodopsins upon light activation including alterations of protein secondary structure, individual residues, and water molecules. These techniques include Fourier Transform Infrared (FTIR) difference spectroscopy at both ambient and cryogenic temperature, ultrafast IR difference spectroscopy, resonance Raman spectroscopy and infrared and Raman microscopy. We produce most proteins in our lab and through our collaborations with the group of John Spudich at the University of Texas Medical School.